Ajax will be the main villain in the Deadpool movie may not look like the most exciting villain but he is a formidable opponent who has a deep, dark history with Deadpool. 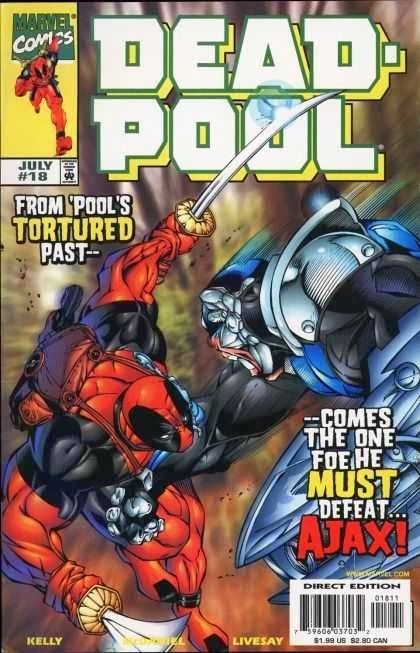 In the comics Ajax has notoriously killed Deadpool twice, and Deadpool has also killed Ajax twice. Both have regenerative abilities that make them difficult to kill permanently. They hate each other and will always do whatever they can to take each other down. There are two big face offs between the two. The first is in Deadpool 's origin tale where they are still Wade Wilson (later Deadpool) and Francis (later Ajax). This is the battle where Francis rips out Wade's heart, kills him. As he is dieing Wade regrows his heart, his healing factor finally activating. This is also what causes Wade to go insane. This is also the moment Wade begins to call himself Deadpool and kills Francis. In the 2nd meeting Francis returns with a super suit that makes him even more formidable. Now going by the name of Ajax he is hunting and killing any survivors of the Workshop. He kills Deadpool again. Deadpool returns to life after seeing all the ghosts of the victims of Ajax. He realizes he must stop him and returns to life. He kills Ajax by short circuiting his suit in water and then drowning him. Ajax is played by Ed Skrein in the film Deadpool. He looks very similar to his comic counterpart. Then the next images of Ajax seem to be after both men have been upgraded after Wade has escaped the Workshop. Who is Deadpool? What are you nuts?